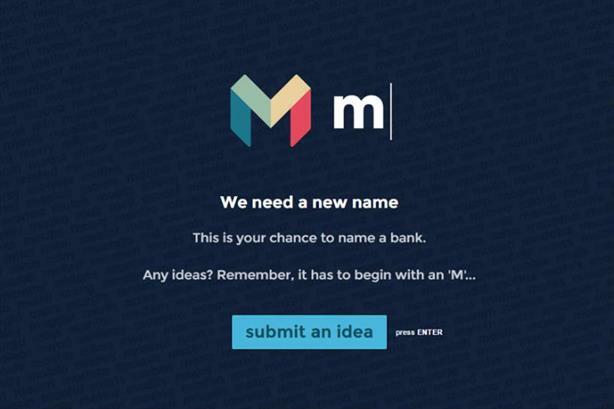 British challenger bank Mondo has turned to the public to find a new name after being legally challenged over the trademark by an unnamed company. The company has fought the legal battle over the last year and has now decided to change its name to appease the third party. According to its website, Mondo is the trading name of Focus FS Ltd. But Mondo is being circumspect after the Natural Environment Research Council unwisely asked the British public to name a £200m polar research vessel, ending up with ‘Boaty McBoatface’ as the most popular name. Though Mondo has stipulated new name suggestions need to begin with ‘M’, so the company can keep its logo, it has registered bankymcbankface.co.uk – just in case. The domain now redirects to Mondo’s homepage. "We have bankymcbankface.co.uk, just in case anyone thought that would be a funny joke," Mondo’s marketing chief Bailey Kursar told Campaign. "We want to keep the M [logo] and find a name that’s easy to remember, not offensive and that works in multiple languages." She added that even with a trademark search, it was difficult to find "every single challenge". "We did perform searches at the time and were happy with what came back," she said. "But we’ll be doubling down on due diligence on the new name." Though the app-only bank has yet to be granted a full banking licence by the Financial Conduct Authority, Mondo has 155,000 members signed up to its email list and received around 7,000 new name suggestions after a few hours. Users can make suggestions until midnight tonight (14 June), after which the team will compile a shortlist. Kursar said Mondo hoped to announce a new name in a fortnight’s time, with the website, app and social channels being rebranded accordingly. Though acknowledging the trademark challenge had been "a bit of a pain", Kursar said Mondo was "quite happy" to involve its user community in the rebranding exercise. Mondo held a review last year for advertising and media agencies, but decided to keep the business in-house.